﻿ Matthew 5:13 "You are the salt of the earth; but if the salt has become tasteless, how can it be made salty again? It is no longer good for anything, except to be thrown out and trampled under foot by men. "You are the salt of the world. But if the salt should lose its taste, how can it be made salty again? It's good for nothing but to be thrown out and trampled on by people. Ye are the salt material of the earth. But if the salt material becomes ineffective, by what will it be salted? It is potent for nothing further, except to be cast outside and to be trodden down by men. "You people are [like] salt on the earth. But if salt loses its flavoring ability, how will it ever get it back again? From then on it would be good for nothing except to be thrown out onto the roadway and walked on by people. [Note: This was mined salt which, when losing its "saltiness" due to exposure to the sun or rain, was simply disposed of by being dumped onto the roadway where people walked]. 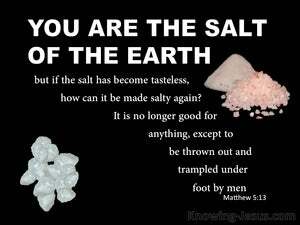 You are the salt of the earth: but if the salt has become tasteless, by what means shall it become salt again? It is then good for nothing but to be thrown out and trod upon by men. 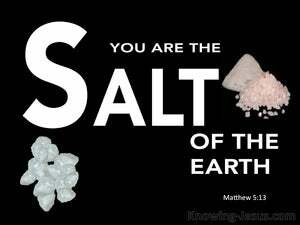 "You are the salt of the earth. But if the salt loses its taste, how shall it be made salty again? It is no longer good for anything, except to be thrown out and trampled under foot by men. Ye are the salt of the earth; but if the salt become insipid, how shall it recover its savour? it is no longer fit for any thing, but to be cast out and trod under foot. Ye are the salt of the earth; and if the salt may lose its savor, in what shall it be salted? It is yet without value, except having been cast out, to be trodden under feet by the people. "You are the salt of the earth! But if salt loses its strength, how can it be made salt again? It is good for nothing but to be thrown away and trodden underfoot. Ye are the salt of the earth: but if the salt have lost its savour, wherewith shall it be salted? It is thenceforth good for nothing, but to be cast out and to be trodden under foot of men. Ye are the salt of the earth, but if the salt has lost its savour, with what shall it be salted? From then on it is good for nothing, but to be cast out and to be trodden under foot of men. Ye are the salt of the earth: and if the salt be rendered insipid, with what shall it be salted? it is yet strong for nothing, except to be cast without, and to be trodden under foot of men. "You are the salt of the earth. But if salt becomes tasteless, by what will it be made salty? It is good for nothing any longer except to be thrown outside [and] trampled under foot by people. You are the salt of the earth, but if the salt loses its savor, with what shall it be salted? It is no longer good for anything, but to be thrown out and to be trodden underfoot by men. "Ye are the salt of the earth: but and if the salt have lost her saltiness, what can be salted therewith? It is thenceforth good for nothing, but to be cast out, and to be trodden underfoot of men. You are the salt of the earth. But if salt becomes insipid, what can make it salt again? After that it is fit for nothing, fit only to be thrown outside and trodden by the feet of men. "You are the salt of the earth; but if the salt lose its savor, in what way shall it be salted? It is henceforth good for nothing but to be thrown out and trodden under foot of men. "You are the salt of the earth. But if salt loses its flavor, how can it be made salty again? It is no longer good for anything except to be thrown out and trampled on by people. Ye are the salt of the earth. But if the salt have lost its savor, wherewith shall itself be salted? It is thenceforth good for nothing, but to be cast out, and to be trodden under foot by men. You are the salt of the earth; but if the salt has lost its strength, with what shall it be seasoned? It is good for nothing more, except being cast out to be trodden upon by men. Ye, are the salt of the earth; but, if the salt become tasteless, wherewith shall it be salted? it is good, for nothing, any more, save, being cast out, to be trampled on by men. Ye are the salt of the earth: but if the salt become insipid, with what can it be salted? it is of no farther use for any purpose, but to be cast out, and trodden under foot of men. It is you who are the Salt of the earth; but, if the salt should lose its strength, what will you use to restore its saltiness? It is no longer good for anything, but is thrown away, and trampled underfoot. Ye are the salt of the earth: but if the salt hath lost its savor, with what shall it be salted? it is thenceforth good for nothing, but to be cast out, and to be trodden under foot by men. "*You* are the salt of the earth; but if salt has become tasteless, in what way can it regain its saltness? It is no longer good for anything but to be thrown away and trodden on by the passers by. "You are the salt of the earth. But if salt loses its strength, what can make it salt again? It is good for nothing but to be thrown away and trodden under foot. "Ye are the salt of the earth; but, if the salt become tasteless, with what shall it be salted? It is henceforth good for nothing, except, when cast without, to be trodden under foot by men. Ye are the salt of the earth, but if the salt be grown insipid, wherewith shall it be seasoned? it is no longer fit for any thing, but to be thrown out of doors, and trodden under foot. 'Ye are the salt of the land, but if the salt may lose savour, in what shall it be salted? for nothing is it good henceforth, except to be cast without, and to be trodden down by men.